Federation for American Immigration Reform (FAIR) is running ads on YouTube warning that immigrants are “flooding our nation” and telling people who live in the suburbs that “your quiet little byway will become a six-lane highway” if immigration is not restricted. 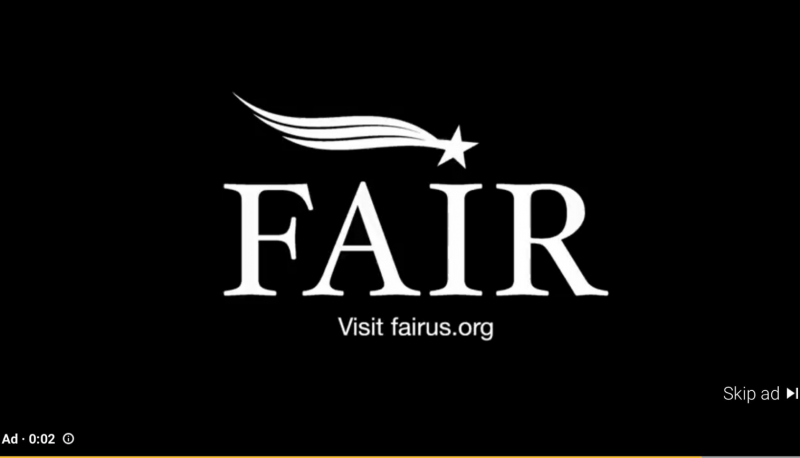 The advertisements end by encouraging viewers to visit FAIR’s website for more information. FAIR is currently listed at the Southern Poverty Law Center as an “anti-immigrant” hate group for its extreme stance on reducing immigration quotas in America to what it once described as “the lowest feasible levels.”in order to preserve, according to founder John Tanton, a European-American majority in the U.S. SPLC has documented Tanton’s connections to white nationalists and anti-Semites. Since its founding in 1979, the group has sought power by lobbying politicians and disseminating propaganda that paints all immigrants as detrimental to American society. The organization has been one of many anti-immigrant groups finding degrees of success guiding President Donald Trump’s administration in crafting immigration policy. Many former employees of FAIR and the organization’s legal arm Immigration Reform Law Institute (IRLI) have entered high-rank positions around the Trump administration. Earlier this year a former IRLI employee resigned after The Atlantic revealed emails tying him to white nationalists. The ad space on YouTube purchased by FAIR was brought to the attention of Right Wing Watch after a Twitter user reported that they were delivered an ad from the group “on video game channels.” FAIR’s YouTube page lists numerous additional advertisements that appear to be edited to lengths deliverable by social media such as Twitter, or by text. A user on Reddit asked about a similar ad they were fed in September. YouTube’s listed hate speech policy forbids content hat “has the primary purpose of inciting hatred against individuals or groups” on attributes that include “race or ethnic origin.” While this specific FAIR ad does not seem to explicitly violate that rule, it can be argued that FAIR’s mission and activities do that exactly. Earlier this year, YouTube was criticized for placing anti-LGBTQ ads from Alliance Defending Freedom—listed by SPLC as an anti-LGBTQ hate group—as the opening ad on videos published by LGBTQ creators. FAIR and Google have not answered Right Wing Watch’s requests for comment. We will update this article if we receive a response.